This weekend I took a refresher course in first aid and CPR with a group of colleagues from the school. Our school physician, Dr. Lilly, brought us down to the City Institute for Emergency Medical Aid (Gradski Zavod Za Hitnu Medicinsku Pomoć 94). As you can see, the building is a bit run down, but it has a fleet of around 100 ambulances with a staff of paramedics, nurses, and doctors on call. 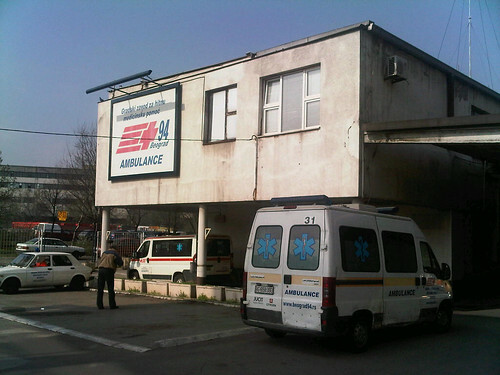 The “911” number here in Belgrade “94” which you can see in the title of the Institute. I also learned that “92” is the police department and “93” is the fire department. And “95” is to get the time, which in the age of cell phones is a relic. I remember growing up, my brothers and I thought it was the coolest thing to call the automated time “8212” in my village of Michigan. I don’t want to give this number to the kids yet, because they will be calling it all the time. They even had a couple Zastava vehicles as you can see in the photo above. The Zastava company is the Fiat/Yugoslavia(Serbian) company most famous in the US for producing the Yugo back in the 1980’s. You still see a lot of Zastava cars here in Belgrade and people make a lot of jokes about them. 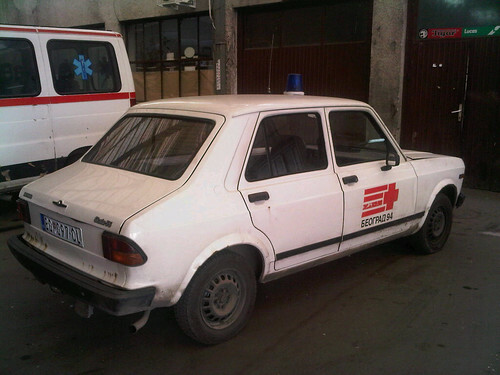 I could do a bunch of blog posts on the beloved Yugo and the other cars from the Communist Era. It was a good course to do because I haven’t done one in about 10 years. The CPR rhythm has changed from 15 pumps / 2 breaths to 30 pumps / 2 breaths. I also learned how to use a defibrillator and the importance that all schools should have one handy, although they are expensive. We also reviewed what to do in a variety of emergency situations and we all earned a certificate after the class. I would like to thank Lilly and the team at the Institute for giving the course. I also learned some Serbian phrases “Ne diše” (He/She is not breathing.) and “bez svesti” (without consciousness) to help me with the 94 call. I’ll go over the numbers with my family so everyone knows. Hopefully we’ll never have to use it, but it is good to know.